No one has ever written a book like this before. Most books whose subject matter concerns military activities involve descriptions of heroic actions performed by the participants and give details of equipment, strategies, tactics, unit movements and the like. Some try to develop the colorful personalities of the central characters and relate stories of how these men influenced the battle, but no one has ever written a book like this one. What you are about to read is a comprehensive research study which accurately identifies and locates undiscovered graves of many Marines and Sailors killed in action during the battle for the island of Betio, Tarawa Atoll, Gilbert Islands. I must caution you that this is not a book about war. It is not about the United States Marine Corps, the United States Navy, Army or any other military organization. It is rather, a book about honoring sacrifice. It was written to recognize and honor a small group of American heroes, all of whom died in service to their country and to the cause of freedom. Who these men were and what they did materially affects the way we live today, and it is in their memory that this work was created. On November 20, 1943, elements of the 2nd Marine Corps Division landed on a tiny Pacific Island named Betio, Tarawa Atoll in the Gilbert Islands. Five-thousand heavily armed Japanese Marines were waiting for them. This date was early in World War II and an assault on a heavily fortified beachhead had never been attempted before. No one was prepared to predict the outcome of what was about to happen. Seventy-six hours later, the American flag was raised over Tarawa, and in those few short hours on that very tiny island, 5,000 Japanese men and 1,113 American Marines and Sailors lost their lives. Most of the those killed were buried on the island in hastily-dug graves and cemeteries where they were to remain until the end of the war. Sortly after World War II ended, the remains of the American servicemen killed on Tarawa were recovered and brought back to America for their final disposition. But, many of the Marine graves could not be located and were left behind. Everyone agrees that dozens of Americans were simply "lost" and are still buried on Tarawa while dozens of others who were found could not be identified. It has remained this way for the past six decades. Attempts have been made to locate those left behind and to identify Tarawa's "unknowns," but without much success. All of that is about to change. 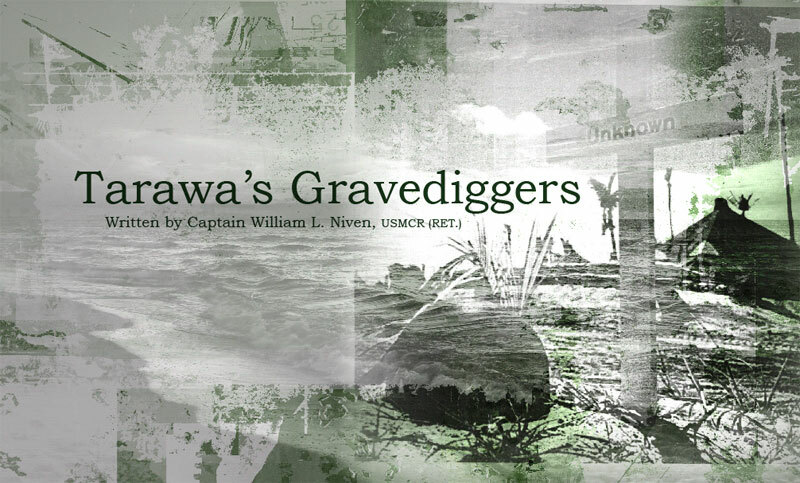 This is the story of Tarawa's gravediggers and the unrecovered and unidentified Marines who died there.